Corsair finally added RGB lighting to their excellent ML fans, and with it added, we possibly have the best balance of performance, noise, and aesthetics. Featuring a magnetic levitation bearing, a fine-tuned rotor for high static pressure applications, and four addressable RGB LEDs. 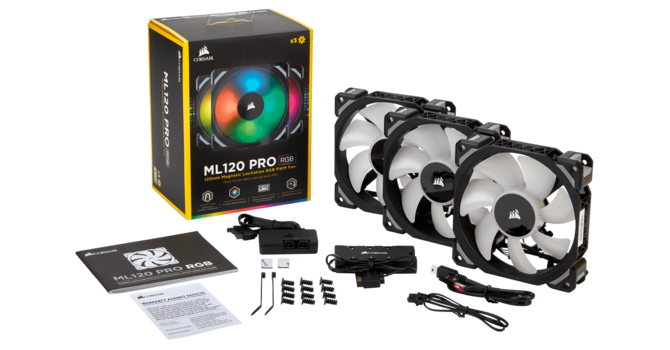 "the Corsair ML120 PRO RGB fan is merely the ML PRO LED with RGB LEDs. However, things are not as simple as they might seem. For one, the fan has the same number of LEDs that are hub-mounted (four), but these are individually addressable, so the hardware is capable of more. Secondly, Corsair tells me that in the year since the ML PRO was released, they have continued to tweak the design, so the new fan should not suffer from a performance deficit with the LEDs taking up room and making the blades shorter, which hurt the LL RGB fans. I have here the triple pack of 120 mm fans which, as with their other recent fans, comes with a bundled LED fan hub, their Lighting Node PRO, and all the cables and accessories needed for software control over the lighting."